Our Interleavers place paper under or around your sliced portions for easy separation during sandwich preparation, and our automatic counter/stackers create accurate stacks for easy loading into the final package. The PPI-200 handles many sandwich kit portions, including extra-thin shingles, fluffed portions, and folded portions.The paper, film, improves ease of separation, sanitary handling, freeze release, improved shelf life, and portion control. Interleaved (underleaved) products can be conveyed to one of our modular auto stackers for hands-free counting and auto stacking before introduction to your packaging or wrapping machine. Gain additional line flexibility with our bypass option. This option is available to accommodate processing of non-interleaved or non-stacked product and allows these products to be introduced to the packaging machine without having to take the interleaver or stacker out of the line. All of our solutions are available as a combination interleaver and stacker or as standalone components designed to fit your application. The PPI-200 product line is a sanitary, washdown-duty, stainless steel system. The streamlined design incorporates leading-edge Programmable Logic Controller (PLC) and servo motor technology, ensuring low maintenance and a long machine life. With compact designs available, the PPI-200 requires a minimal amount of floor space and is engineered to exceed the American Meat Industry’s 10 Principles of Sanitary Design. The PPI-200 product line features rugged, stainless steel construction and climate-controlled (dehumidified), fully gasketed enclosures. Our PLC-based design enables easy production setup and changes, as well as networking with other equipment. 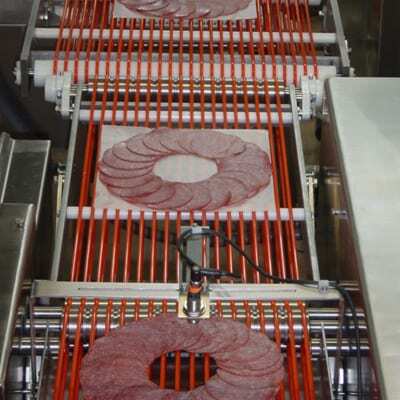 The Multi-lane Deli Slice Interleaving and Stacking Solution by Pacproinc®. automates the process of placing paper between sliced portions, counting drafts, and stacking drafts in the required format for final packaging. This particular configuration includes the Elevation Option which improves ergonomics by discharging finished stacks directly over the loading area of the packaging machine. Stand-off mounted components prevent the trapping of any product scrap improving sanitation. Ground and polished welds further eliminate bacteria harborage points, making cleaning to a microbiological level possible. All machines are available with casters or leveling pads to meet your plant’s unique requirements. Trays keep product scraps out of the paper path and paper tails off the floor to prevent material contamination. Welded construction eliminates recessed bolt heads and other areas that could collect product cast-offs and harbor bacteria growth. Pacproinc® equipment is built to accommodate your application, with standard operating widths ranging from 3-40”. These solutions can be configured for single lane, multiple lanes, or unique groupings. Our patented jam detectors significantly reduce costly downtime, and the PPI-200 includes Allen Bradley controls and touch screens as standard equipment. All programming is done by our in-house automation engineers, and all Pacproinc® systems are supported by our 24/7 service team. Don’t need interleaving? No problem. Pacproinc® offers a variety of high-volume, multi-lane, modular counter/stackers to fit any application, and our custom design easily interfaces with upstream production equipment and end-of-line packaging machinery, or other unique production line layouts. High-speed, sanitary, hands-free counting/auto stacking guarantees better, more accurate stacks for easier packaging and improved product presentation, even for differing product requirements. And our patented in-line foldover process further extends the potential benefit. Counting and auto stacking reduces labor and training expenses, as well as the incidence of repetitive motion injuries. The PPI-200 increases line throughput while cutting operating costs and improving your product presentation and packaging. Like all of our designs, our stand-alone counters/stackers benefit from our knowledge and industry experience to include feature rugged, stainless steel construction and climate-controlled, fully gasketed enclosures, enhancing sanitation and food safety. Our PLC design enables easy production setup and changes to parameters like stack count, delay, speed, and portion thickness, and our solutions are easily networked with other equipment to seamlessly interface with production requirements like product changeover or stoppages. Pacproinc® can configure your PPI-200 to accept product in single or multiple lanes. We can also singulate (combine multiple lanes into a single lane) finished stacks for delivery to the packaging machine, and all stackers can be fitted with our Remote Monitoring and Diagnostic System (RMDS). Further, our complete solutions include materials and 24/7 support, along with matched rolls for multi-lane processing. The PPI-200-SS-CD card feeder is designed specifically for harsh environments and interfaces easily with any slicing, forming, processing, or packaging equipment. Our inline designs save valuable floor space, while automated reloading systems allow for continuous operation, and precision card placement ensures accurate automation. This reliable feeding system will not jam or double-feed, as is common with traditional card feeders. Its large-capacity magazine allows for extended run time (up to 45 minutes between reload), and the system features an automated, UPC code-enabled fast setup to accelerate card setup and changeover. Versatile designs allow users to run many types of cards (e.g. window, non-window, foldable flap, or no flap). Pacproinc® can help plant managers solve labor issues while cutting costs and increasing efficiency.